Usually when people think about the subject of hair loss, they tend to just have men in mind. However, there are plenty of women who suffer from premature hair loss too, and some experts estimate that as many as 1 in 4 women will experience hair loss at some time in their lives. This figure may surprise you but there are several reasons why we don’t notice large numbers of women suffering from premature hair loss. Often they are much better at disguising the condition than men, the hair loss is often less severe than men experience, and the loss is spread more evenly over the head rather than concentrated at the crown, as it is with men. 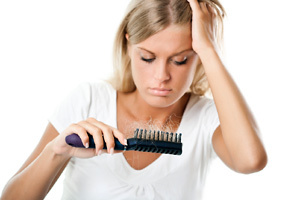 In female pattern hair loss women may actually lose hair for some of the same reasons as men. They have a reaction to the male hormones in their body – specifically the conversion of testosterone to dihydrotestosterone (DHT). In female pattern baldness the loss of hair can start later in life than it does in men and the effects are less extreme because women still have the support of estrogen in their body. Menopause can also contribute towards hair loss because of the changes in hormonal levels, such as the increasing levels of testosterone that are experienced at this time. Sometimes women are prescribed antidepressants for the mood swings associated with the menopause, and these have also been found to sometimes cause hair loss. Hair loss can also be attributed to a traumatic event that causes stress to interfere with the normal hair growth cycle, triggering a condition known as Telogen effluvium. This is the second most common cause of hair loss in women, but it is reversible as the body adapts to the stress or the stress is relieved. The stress placed on a woman’s body during pregnancy, problems with the thyroid gland, and diabetes are other common causes of Telogen effluvium. Another type of premature hair loss is Alopecia areata which is a disease of the immune system which causes it to attack the hair follicles, causing healthy hair to fall out in small, round patches all over the head. Some physicians think it may also be a result of a deficiency in the immune system, since in many cases the hair does often re-grow spontaneously. Researchers have theorised that this type of hair loss may be the result of nutritional deficiencies that cause a shortage of proteins such as iron (serum ferritin). Women who have experienced regrowth without having had any treatment may have inadvertently corrected the nutritional problem without realizing it. Several essential oils can help hair regrowth because of their ability to stimulate the tiny blood vessels of the scalp where the hair follicles are created. This stimulation helps to increase the blood flow which carries the nutrients so vital to the follicles. This is why the condition of the scalp is so important, and the correct essential oils used in regular scalp massage stimulates the microcirculatory system, relaxes the muscles of the scalp, and has a beneficial toning action too. The essential oils were blended in a base of jojoba and grapeseed carrier oil and used on group ‘A’. The second group ‘B’ had just the base massage oil massaged into their scalp. The results revealed that 44% patients in group ‘A’ using essential oils showed improvement compared with just 15% patients in the control group ‘B’. The degree of improvement on photographic assessment was found to be highly significant. The nutrition and conditioning provided by carrier oils such as arnica, calendula, black seed, borage, coconut, evening primrose, jojoba and macadamia when blended together with essential oils provides a truly power-packed remedy for this distressing condition. If you prefer, your essential oils can be added to a hypoallergenic carrier lotion instead of a vegetable oil. Select your essential oils from those above or the list in the sidebar below, add 5 drops to every 10mls of carrier oil, and mix together well. Pour a small amount of the blend to your hand, spread it evenly across both hands and work it into your scalp, not on your hair. Gently massage in small, circular motions all over your scalp without causing too much friction since this can damage hair roots. After a few minutes of massaging the scalp, bend over and hang your head lower than your heart to really increase the blood flow whilst continuing to massage. 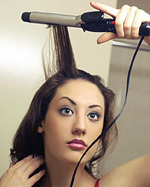 Keep the mixture on your scalp as long as possible, and if it’s practical leave it overnight, then shampoo it out. To boost your treatments add your essential oils (5 drops to 10mls) to a fragrance-free base shampoo, conditioner or carrier lotion which has been specially formulated to work as an aromatherapy carrier. Sadly there are no miracle cures for hair loss and to achieve the best results you must commit to massaging your scalp regularly, improving your diet, and adjusting your lifestyle to reduce stress. However, it is possible to prevent further loss of hair and encourage re-growth by persevering with consistent, regular and focused essential oil treatments in combination with dietary and lifestyle adjustments. As always though, you will only get the best results reversing your hair loss if you use essential oils of the very highest quality and purity. It takes time and effort to encourage and maintain healthy hair, and you don’t want to compromise your results by using cheap inferior essential oils through trying to save a little money. Quinessence pure essential oils have been expertly chosen and analytically tested for purity. To find out more and see prices, check out our full range of organic and conventional pure essential oils. Overcoming Stress-Induced Hair Loss With Aromatherapy Essential Oils For Healthy Hair How To Have Great Hair – Naturally! Hair follicles grow in cycles; the actively growing phase (anagen), the transitional (catagen) phase and the resting (telogen) phase when hair stops growing. The resting phase can last up to 3 months at which point the hair falls out, and then there is a delay of a month or so until a new hair begins to grow from the same hair follicle. This is why it can take so long to see any positive results with regrowth. Hair loss can be caused by improper treatment during styling such as with tight curlers, cornrows and tight braids or weaves. Each of these hair styles put constant pressure on the root of the hair which can cause damage to the hair follicle. Certain harsh chemicals used in dyes, relaxers and bleaches can also cause the hair to fall out prematurely. At other times medications that a woman may be taking to treat a medical problem could also cause the hair to fall out prematurely.